As ornithologists strove to keep pace with the explosion of knowledge about the birds of the world, monographs describing a single species or group of species were increasingly published. 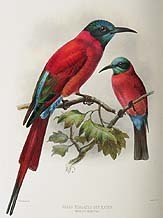 A famous figure in European ornithology, Henry Eeles Dresser [1838-1915], issued a major work in 1884-1886 entitled A monograph of the Meropidae, or family of the bee-eaters. Another important ornithologist and prolific author, Richard Bowdler Sharpe [1847-1909], produced the handsome A monograph of the Hirundinidae, or family of the swallows from 1885 to 1894. The Hill Collection also includes a copy of the 1887 first printing of the fine book on shorebirds by Henry Seebohm [1832-1895], The geographical distribution of the family Charadriidae. In 1897, as the century closed, Frans Ernst Blaauw [1860-?] issued his attractive A monograph of the cranes.